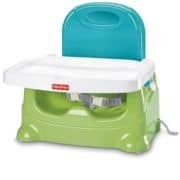 After going through the baby and toddler eating stages with a high chair, I feel it’s easier to start with a portable booster. Your teeny tiny baby is getting bigger and you’re so excited to give them their very first taste of solids. It’s so fun and exciting. Now you’re suddenly in the market for a little seat for them to eat all the new baby food. All the mess and perfect picture moments await in this fun phase. When our youngest was ready for solids I went out and bought the all white IKEA high chair. It’s cheap and seriously so cute in pictures. I thought it was great. Then our busy little guy got bigger and busier. I turned around to see him standing on top of the tray. I about died, and like everything in those terrifying moments, it seemed like slow motion trying to run over and grab him before he fell head first on our hard tile floor. Luckily I got to him in time with my heart pounding!! Enough was enough. After that, I was on the lookout for a booster chair that had a tray that could tighten right to his stomach. We found one. and the difference has been night and day! I purchased an extra cheap used chair to avoid using one of our dining table ones. Truly it was a matter of safety at this point. He never slipped out once, and he is one busy little guy, so a portable booster seat is the way to go! If you’re at that same stage, here are a few I’d recommend. 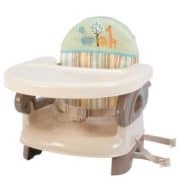 If you’re looking in the $35 to $50 range, the Fisher Price Booster is a great option. It’s easy take with you anywhere. It’s so easy to clean and the tray can fit right in your dishwasher too. 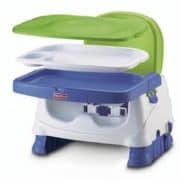 In addition to the standard tray, it has a feeding tray with a cute little sippy cup holder on top that they eat on. This makes it all the more sanitary! It can adjust for height, too. 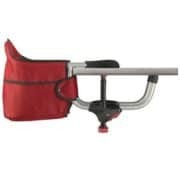 If you do take it with you, it has a shoulder strap for on the go and will fit right on any basically any chair. Overall I like this one. It’s cute, has a green snap on lid to cover the tray, and is easy to keep nice and clean. It can hold up to 50 pounds. 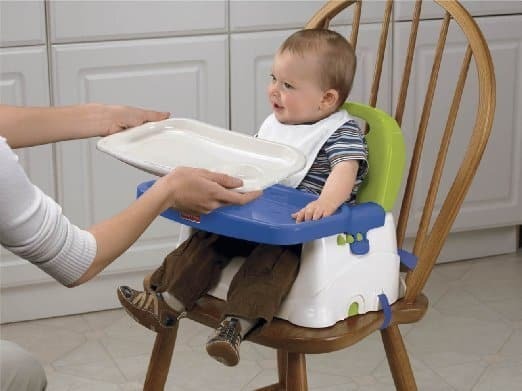 Also, you can keep the baby right at your dinner table and it will not take extra big space that a bulky high chair does. This is a great deal for a booster. It is simple and comfortable, easy to clean, and space-saving. 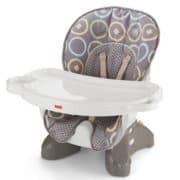 It is neat because the infant feeding seat with a tray becomes a booster seat at the table. It has a two-level height adjustment. The tray is also dishwasher safe. As it’s so affordable, you can buy this one to travel with to Grandma’s house or wherever you go. The tray slides closer and it has a seat belt. The cover makes it softer for your little one. It is so easy to wash and it washes great. If you’re looking for a great booster at home or a quick and easy option for on the go, this is the one. My friend has this one and has loved it so much. It takes zero space in your kitchen and it hooks on the end of her dining table or even island. 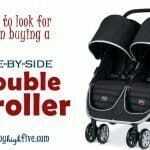 It only weighs 7 lbs and folds compactly for easy storage and easy to take on trips. It has rubberized hippo grips that secure it to the table but don’t leave marks on wood or granite. The baby really likes it too because she can sit right next to everyone at meal time. 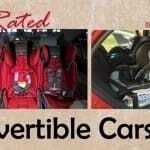 For safety, it uses a 3-point safety harness to strap them in. Portability is a plus, and my friends regularly take it with them to restaurants. It’s nice because you don’t need to use the germy restaurant high chair, and let’s be real: sometimes they are pretty dirty. A con of this one would be the food does just fall since there isn’t a tray. This means you do have to wipe food out of the seat if it falls. Overall, though, I like this one. It’s at an easy price point, is very easy to use, and is very trendy and cute. This is a great one, too. It folds with an-over-the-shoulder strap for on the go, and the tray can fit in the dishwasher. It’s easy to clean and easy to set up on any chair and secure it down. Of course, I love that the tray is adjustable so they can’t wiggle out. This one doesn’t have fabric so there is less clean up and no need to wash anything. Just wipe it right up. It’s easy to keep set up or store away in the pantry when you’re not using it and has cute blue, white, and green colors. I like the comfort of this one, as it’s taller in the back but is more comfortable for your little one. For cleaning, it’s machine washable, and a huge plus is that you can take off the back. It’s a lot easier than trying to wipe up the mess. Just throw it in the washing machine, and no scrubbing sticky food. It also dries really fast by just air drying. In addition to being fairly easy to clean, it’s cute. Fisher Price makes three designs with different patterns and colors to choose from. 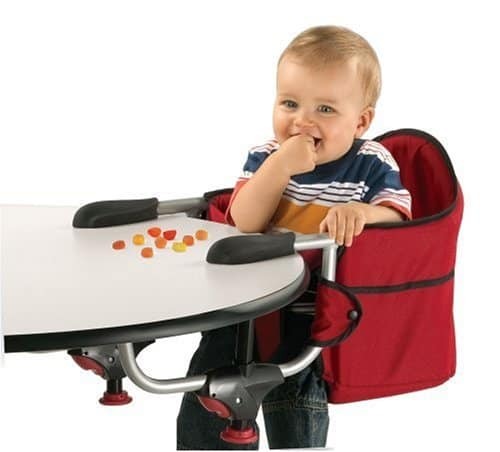 Unlike many other portable high chairs, this one can recline back for when the baby is little to make it easier to feed them. When your child has gotten bigger, it converts to a toddler booster chair without the back. It is a great investment and can take you through all the stages. The tray is adjustable so they can’t wiggle out and has a five- point harness to buckle them in. It has a built-in cup holder as well as a little fast finder link for a bib, towel, or toy, which is really nice. I really like this option. They can sit at the dining table with brother, and you don’t have a big high chair in taking up floor space. 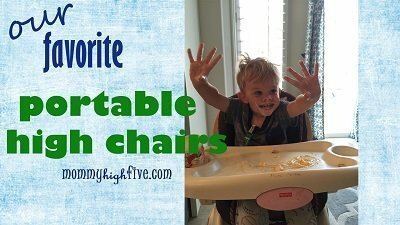 I love these portable booster high chairs. To me, they hit all the mommy sanity marks. They don’t take up all the space in your kitchen with a big messy high chair. They also transport easily. The clean up is so easy, so it stays clean and sanitary. They are not super expensive, and they are safe! I seriously couldn’t believe when my son wiggled out of his IKEA high chair. These options are great because the tray adjusts nice and close, so they are safely in. They can sit at the table and be a part of the family. I loved mine and I know you will too. 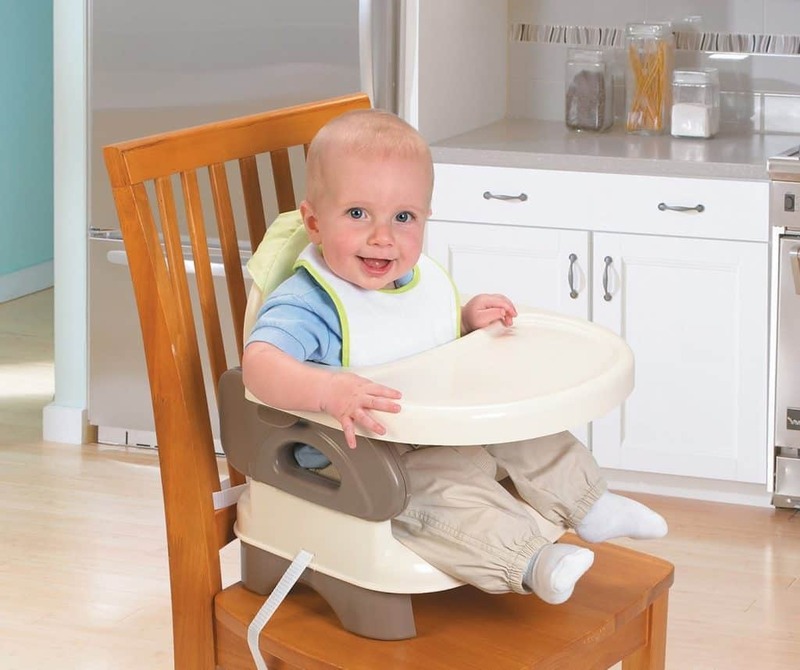 Give it a try as its so affordable and many times more convenient than an expensive high chair. Happy searching, and happy safe messy eating babies. ?